An unusual game that combines traits of a side-scrolling platform game, a music game, and an adventure game. Wandersong is an unusual game that combines traits of a side-scrolling platform game, an adventure game, and a rhythm game. It was developed by an independent studio Dumb and Fat Games and it was funded during a crowdfunding campaign on Kickstarter. 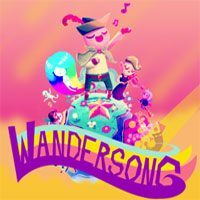 Wandersong takes the players on a journey to a fantasy world created centuries ago by Eya – a goddess that made the reality move by using music. After a long time, the goddess decided to start everything anew by destroying the current, imperfect work. The main protagonist of the game is a bard who is trying to stop the “reset” by finding the mysterious melody known as Earthsong. The protagonist believes that this will help him save the planet from destruction. The events the players participate in during the Wandersong are presented from a side perspective. At first glance, the gameplay mechanics are similar to ones in other platform games with adventure games features – the protagonist is traveling through varied locations, avoiding traps and dangers, helping encountered non-playable characters, solving more or less complicated riddles, and facing various challenges. What distinguishes the game among other similar titles is the presence of music – the title was constructed in such way that the surroundings are directly reacting to players’ actions depending on what melody the players choose to play. The music enables the protagonist to move objects, change the direction of the wind, get rid of the mist, or scare away ghosts haunting houses. The colorful, two-dimensional graphics of Wandersong are nice for the eyes thanks to the cartoon-like style they use. The main developer of the game was Greg Lobanov. He was accompanied by Em Halberstadt, a sound designer who previously worked on Night in the Woods, and by musician Gordon McGladdery, who created the soundtrack to Rogue Legacy and Viking Squad. It is worth mentioning that the game was developed in a modified version of Gamemaker: Studio.